Output 1: LPF+BPF+HPF, output 2: 3xBPF. LPF, BPF and HPF can be switched on and off individually. Cut: Filter 1 (LPF) cutoff frequency. 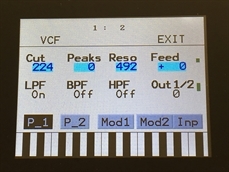 Peaks: Filter 2 (BPF) cutoff frequency, either as an offset to Cut, or as an absolute value, depending on the setting of the Peaks parameter on VCF edit page 2. 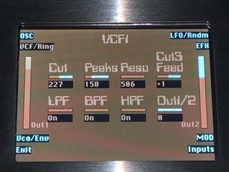 Cut3/Feed: Filter 3 (HPF) cutoff frequency, either as an offset to Cut, or as an absolute value, depending on the setting of the Cut3 parameter on VCF edit page 2. 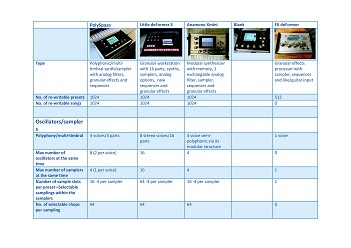 LPF: Switches the filter 1 low pass output on or off. 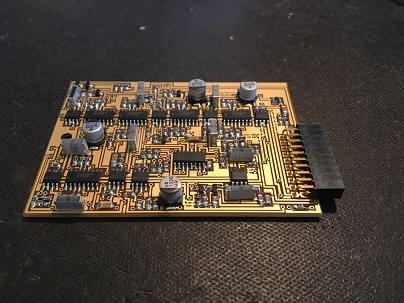 BPF: Switches the filter 2 band pass output on or off. HPF: Switches the filter 3 high pass output on or off. Out1/2: Mixes between LPF/BPF/HPF and 3xBPF. Please notice, that all 3 BPF's are always switched on.